Loco Mogul is a resource management game not unlike Mind Control's Oasis, viewed from an isometric perspective with trade as it's focus instead of conquest. Each round of the game is played out in two phases. The first phase involves surveying a given territory for towns, farms, fishery and mines. Players have a limited number of days to explore the landscape, with each click using up either one or three days depending on the action taken. Important landmarks are usually surrounded by roads on it's sides. Train tracks would then have to be placed strategically to provide service coverage for as many trade locations as possible. 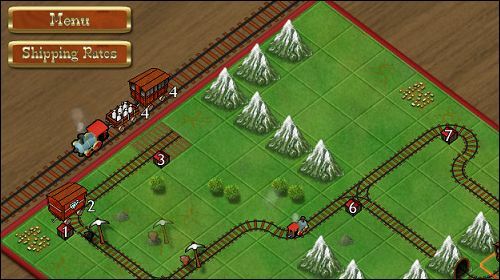 A train is placed on the map for the second phase, and it is for the player to decide which routes to undertake and cargoes to deliver for maximum profit. The train can only carry two cars at any time.